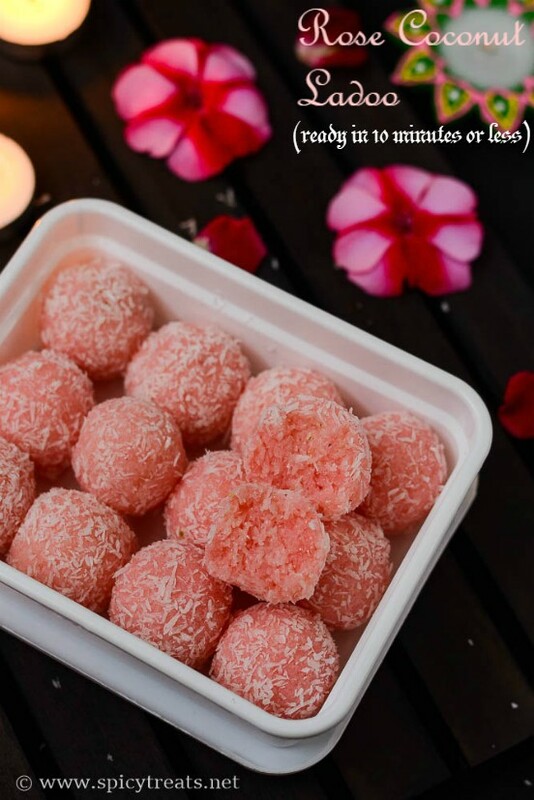 I came up with an Instant sweet recipe, this Rose Coconut Ladoo and still thinking about quick and Instant snack item. If any of you know any quick savory snack item please share it in the comment section below. Thanks in advance. I have tried Coconut Ladoo & Coconut Mawa Ladoo which are similar recipe and that requires only 10 minutes or less to make. I followed my Coconut Ladoo recipe for this with the addition of Rose Syrup or Roofahza. 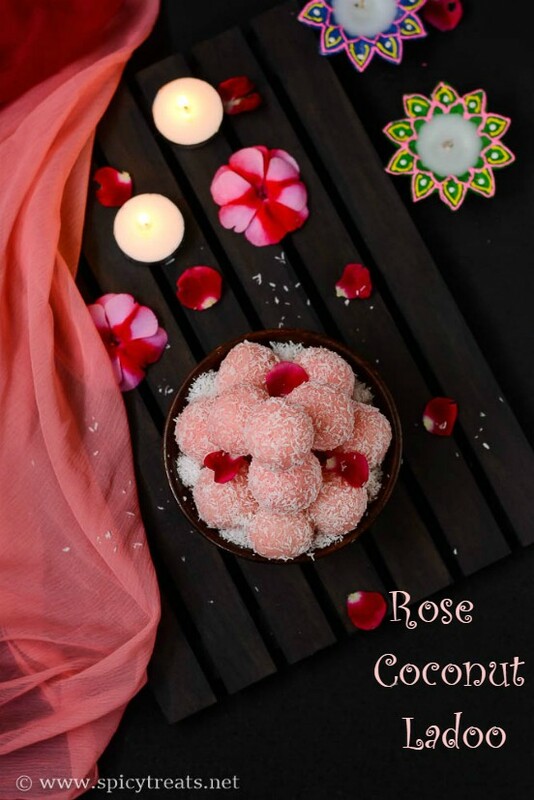 Rose Coconut Ladoo is also an Instant sweet which requires only 3 ingredients. V loves Roofazha flavor and I often make Sherbet or Rose Milk with it for him. Coconut & Roofazha both are his favorite and he loved this Rose Coconut Ladoos a lot than the Regular Coconut Ladoo. 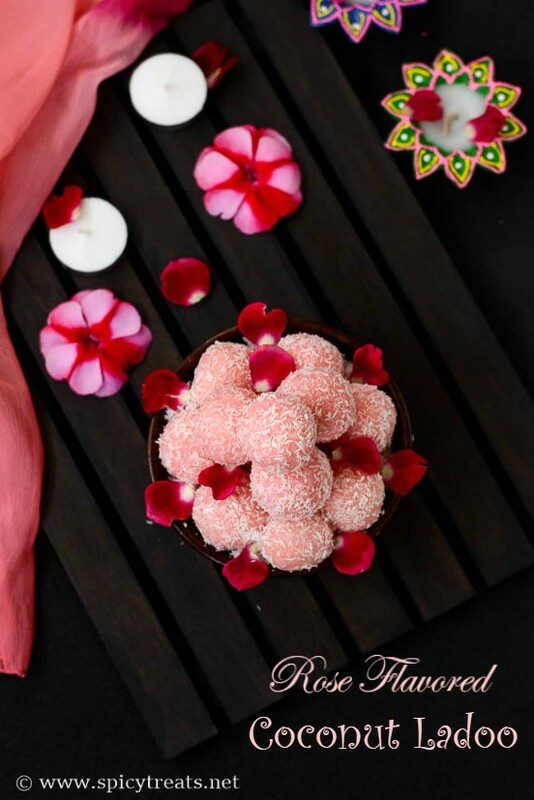 Like V, If you love Rose or gulkand flavor then you will love this Rose Ladoos for sure. Now off to the recipe..
Heat a pan, turn heat to low-medium heat, add coconut and condensed milk, rose syrup and stir well until it forms a soft dough. Just mix altogether no need to saute or cook for long time and remove from stove. Then transfer it to a plate(if you want, you can grease the plate and hands with ghee) and knead it to a soft and smooth dough. And then divide it to 18 equal balls and shape it a round ladoos and roll the shaped ladoo on dessicated coconut and arrange it on plate. 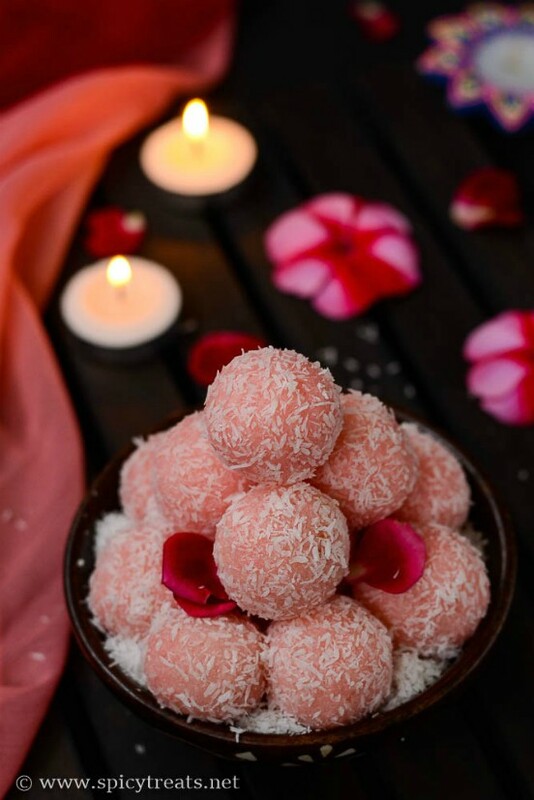 That's it...Delicious Rose Coconut Ladoos ready. This ladoos remains good for a week in refrigerator. 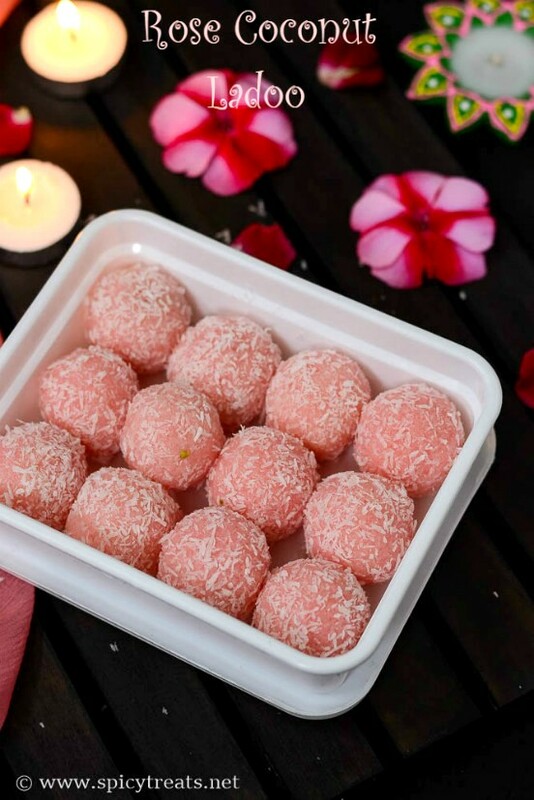 I used Roofazha, My neighbor Aunt suggested to add few drops of rose water after transferring the coconut-condensed milk mixture to plate and then shape it to ladoos. As I used roofazha the flavor was already strong enough so I skipped rose water. 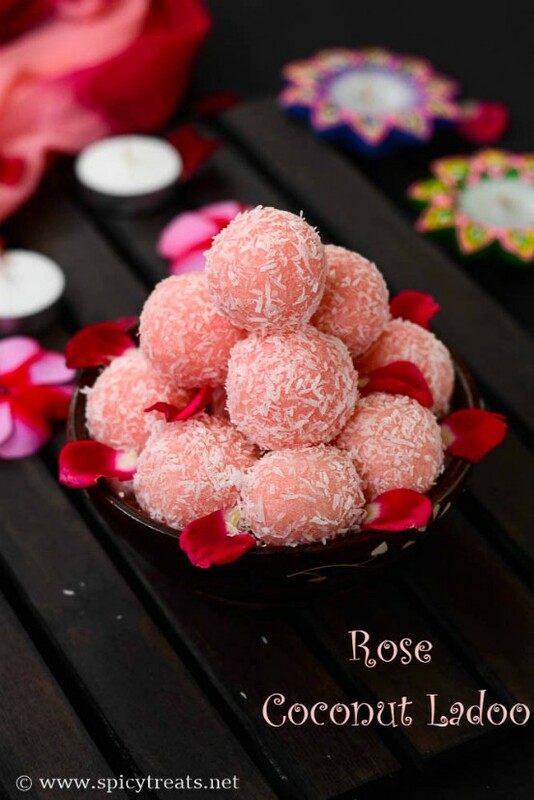 Rose Coconut Ladoo Step By Step Recipe..
Keep all the ingredients ready and start making ladoo. Once the mixed ingredients get along well remove from the heat and shape it to round ladoos and garnish it by rolling it in coconut. Lovely looking ladoos. I will make these and sell to my classmates.